GREENFIELD- Resolved and Ordered on August 1, 2013 effective January 1, 2014, Hancock County officially joined other counties as a vote center county. Hancock County will be the tenth Indiana County to switch to the vote center model. 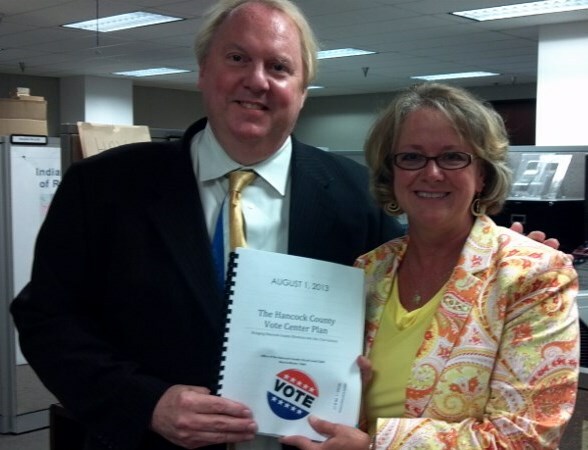 I am excited to announce that the Vote Center Plan has been filed with the State of Indiana Election Division. The plan represents many months of planning and hard work from all those involved, but the benefits to the voters of our county will be well worth the effort we have spent implementing the new model. To learn more about how vote centers operate, to review counties’ vote center plans or to access research on vote centers and their success, visit www.VoteCenters.IN.gov. One Vote Center for every 10,000 registered voters is required by law. Vote Centers utilize the Internet to access a computerized electronic poll book which reduces human error and immediately flags the poll worker if the elector attempts to vote at more than one Vote Center. Vote Centers must have sufficient parking and be ADA Compliant to allow all voters the right to vote. Ideally, Vote Centers are established in large community type centers that will accommodate a large number of voters and reduce the long lines that can be experienced at some precincts. It is the responsibility of the Hancock County Clerk – Election Division to insure access to the public to exercise their right to vote in the most efficient and cost effective manner possible.